Cucumber beetles are the most important insect pests of vine crops or cucurbits (cucumber, squash, melons, and pumpkins) in New York State and across much of the United States. The striped cucumber beetle (Acalymma vittatum) and the spotted cucumber beetle (Diabrotica undecimpunctata howardi) occur in the Northeast. The striped cucumber beetle, typically the most common in New York, feeds primarily on cucurbits, whereas the spotted cucumber beetle has a much wider range of host plants. The immature spotted cucumber beetle is called the southern corn rootworm because it feeds on roots of corn. Cucumber beetles can cause losses to cucurbits by direct feeding on young plants, blossoms, and fruit. They also vector bacterial wilt, which is caused by Erwinia tracheiphila, a particularly important disease of cucumbers and melons. Corn rootworms also frequently infest cucurbits. The northern, Diabrotica barberi,and western, Diabrotica virgifera virgifera, corn rootworms typically appear in cucurbits in the middle to late season. The importance of these species as pests of cucurbits has yet to be determined. Cucumber beetles. Adult striped cucumber beetles (fig. 1) are about 6 mm ('/4 in.) in length and marked with three distinct black and four yellow longitudinal stripes that extend to the tip of the abdomen. The head and abdomen are black. The spotted cucumber beetle is yellow-green with twelve black spots (fig. 2), a black thorax, and yellow abdomen. The larvae (fig. 3) of both species have three pairs of short legs and reach a maximum length of about 9 mm (3/8 in). They are creamy white, and the head and tip of the abdomen are dark. The immatures are soil dwellers and can be found among the roots of cucurbits. Eggs of both species are pale orange-yellow and are laid in groups near the bases of cucurbit plants. Rootworms. The northern corn rootworm is uniformly pale green (fig. 4). The female western corn rootworm (fig. 5) resembles the striped cucumber beetle except that its stripes are less distinct and do not extend to the tip of the abdomen. Male western corn rootworms are mostly black (fig. 6), except for the posterior quarter, which is yellowgreen. The abdomen of the western corn rootworm is yellow, whereas that of the striped cucumber beetle is black. Distinguishing the striped cucumber beetle from the western corn rootworm is important because of their different pest status. Both rootworm species are approximately the same size as cucumber beetles. Cucumber beetles. Striped cucumber beetle adults over winter in protected locations such as in woodland lifter and under soil. Early in the spring they feed on blossoms and leaves of cultivated and wild host plants. In New York they invade plantings of cucurbits in about mid-June just as the crop is emerging, and their numbers remain relatively high through mid-July. Once in cucurbits, the female beetles lay groups of eggs at the bases of plants. These eggs hatch and produce larvae that develop for 2 to 4 weeks on the roots, pupate in the soil, and appear as adults in early to mid-August. This generation of adults remains in relatively high numbers until mid- to late September and then overwinters. The spotted cucumber beetle migrates to the northern United States and Canada each year; some individuals appear very early in the season in New York, however, suggesting that a portion of the population overwinters in northern latitudes. Typically, spotted cucumber beetles begin to build in number in cucurbits in mid-August. Their life cycle resembles that of the striped cucumber beetle, except that most individuals probably do not overwinter in northern latitudes. Rootworms. Western and northern corn rootworm beetles can be very abundant in cucurbits. They have been reported to be the dominant species in cucurbits in Illinois, Wisconsin, and in some areas of New York. Like the cucumber beetles, they are attracted to the crop and stimulated to feed by the cucurbitacins in the plant tissue. Because rootworm populations do not reproduce in cucurbits the immatures do not feed on cucurbit roots. The western corn rootworm, the most common, is most abundant from mid-August to the end of the season, mostly likely because corn (its preferred host) has begun to dry and pollen shed has stopped. Cucumber beetles. Heavy infestations of adult cucumber beetles can destroy stems, cotyledons, and emerging leaves of young cucurbit plants (fig. 7). Cucurbitacins, which act as feeding stimulants, are especially elevated in the cotyledons. Leaves, stems, blossoms, and fruits of more mature plants (figs. 8 and 9) can be damaged, resulting in reduced yield and unmarketable fruit. Excessive feeding damage to young squash and pumpkin plants can result in reduced yield. More mature plants can tolerate feeding damage with little effect on yield. Root and lower stem feeding (fig. 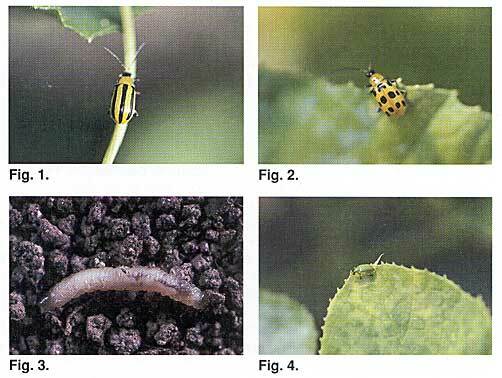 10) by cucumber beetle larvae increases the incidence of certain diseases, but the importance of such damage has not been quantified. 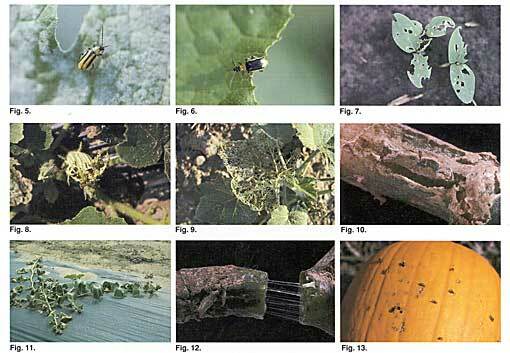 Adult cucumber beetles and some other plant-wounding insects also transmit bacterial wilt to cucurbits. Cucumber and melon species are most susceptible to bacterial wilt, squash and pumpkin less so, and watermelon is not affected by the disease. Observations over the past few years in New York, New Jersey, Delaware, and Pennsylvania, however, suggest that this disease may not be as widespread in the northeastern United States as once perceived. It may also be cyclic in nature or important within some areas but not others. The bacteria may be transmitted mechanically between plants through contact with mouthparts or feces of contaminated beetles. Further study will be required to determine the mechanism by which the bacteria are transferred and what proportion of beetles carry the bacteria. Wilted plants or their runners may indicate the presence of bacterial wilt (fig. 11). Affected runners appear dark green at first, then become necrotic as the wilt becomes irreversible. Wilting is most severe when plants are growing rapidly. Plants may wilt during the heat of the day but recover overnight. Young pumpkin plants may wilt and die within 2 weeks of the first symptoms, whereas summer squash may remain healthy and productive for weeks following the first symptoms. To determine if a plant is infected with bacterial wilt, press together two freshly cut sections of a stem and slowly pull them apart (fig. 12). If a "stringy" sap (bacterial growth and associated resins) extends between the cut ends, the plant has bacterial wilt. Cucumber beetles also vector viruses such as cucumber mosaic but do so much less efficiently than aphids. Feeding by adult striped cucumber beetles and possibly the other beetle species predisposes plants to gummy stem blight (causal fungus Didymella bryoniae); beetles can also serve as vectors of gummy stem blight and perhaps powdery mildew. Rootworms. Rootworms prefer corn, but as corn matures the beetles accumulate in nearby cucurbits where they have been observed damaging mature pumpkins, killing mature winter squash plants, and doing extensive damage to blossoms and fruit (fig. 13). This damage occurs relatively late in the season, and it has yet to be demonstrated whether it is of economic significance. Corn rootworms vector Fusarium wilt in corn, but their role in transmitting this disease or predisposing cucurbits to disease has not been investigated. Larvae of northern and western rootworms do not feed on cucurbit roots, limiting rootworm damage to aboveground plant structures. Only a few species of parasitoids (tachinid fly and braconid wasp) or insect pathogens have been observed affecting cucumber beetles and their impact is not well documented. They larvae are attacked by predacious nematodes. One species of soldier beetle is considered an important predator. Because of the potential losses associated with feeding damage to emerging plants and transmission of bacterial wilt, cucumber beetle control typically requires applications of insecticides. Treatment thresholds and monitoring techniques are under development but not yet ready for commercial use. Pest management options now available or being investigated include the use of less-preferred varieties, behavior-modifying chemicals (attractants), row covers, cultural controls such as trap crops, and insecticides. The presence of cucurbitacins stimulates cucumber beetles and rootworms to feed on cucurbits, and varieties with less cucurbitacin show less damage. Row covers used early in the season can prevent infestation by cucumber beetles. They must, however, be removed once blossoms appear so as to allow pollination by bees. Trap crops (earlyemerging plants or preferred genotypes) also hold potential but need further evaluation. Attractant-baited traps and attracticidal baits are promising for control of cucumber beetles. Attracticidal baits are mixtures of a feeding stimulant (cucurbitacins) and a small amount of insecticide; some baits also include a mixture of volatile attractants. In theory, the cucurbitacins stimulate the beetles to feed, and the volatile attractant draws them to the bait. The biggest advantage of attracticidal baits is that the amount applied per acre is very small relative to a standard foliar application. Traps being developed could be used for early detection of infestations and possibly for control if several traps are used per field. (1) Susceptibility of the variety to bacterial wilt. Cucumbers and melons are highly susceptible, other cucurbits less susceptible, and watermelon is not affected by the disease. (2) Timing of applications. Striped cucumber beetles appear to be most active between dusk and dawn, suggesting that insecticides (contact sprays) applied in the evening may be more effective against this pest. Striped cucumber beetles colonize cucurbits and continue to increase in numbers for about 2 weeks early in the season. To avoid having to treat more than once, wait until the field is fully colonized rather than treating at the first sign of a beetle. When making this decision, consider the susceptibility of the variety to bacterial wilt. Where legally permitted, the use of systemic insecticides may be essential for the production of cucumbers and melons susceptible to bacterial wilt. Fields should be monitored at least twice a week when plants are emerging. (3) Tolerance of feeding damage. Young cucurbits can tolerate some feeding damage without a loss in yield. As they mature, they can withstand even greater damage. If the cucurbit is not highly susceptible to bacterial wilt, young plants can tolerate some injury (conservatively, up to 25 percent leaf removal). The amount of tolerance varies with the cucurbit cultivar, plant density, and stage of growth. Link to Factsheet on Bacterial Wilt of Cucurbits "Signatutre Symptoms"